Komodo National Park has long been on my radar (of course) for the dragons, but also for world-class diving. We have met many people along our journey who have visited and praised the area and even said it was a highlight of their round-the-world trips. The gateway to Komodo National Park is the island of Flores and specifically the gritty town Labuan Bajo. There are a couple of options for getting there, 1.5 hour flight from Bali or 4 day boat adventure from Lombok. While the 4 day boat adventure peaked our adventurous curiosity, we opted for the quick flight in the hopes of spending our money on a multi-day boat trip within the National Park. You can also take a very long bus ride, but that option quickly fell off our radar when we looked at the travel time. Labuan Bajo is a bit of a hole. To be fair though, it’s undergoing a lot of construction and it certainly feels like they are making steps to improve it as a destination. Currently, it’s a stinky port town that you need not write home about. Nic found a hostel above town called Ciao which would make the perfect home base for the next 5 days. Ciao Hostel was the perfect distance out of Labuan Bajo and has an incredible view. The hostel also offered free shuttles every hour to town and the airport, which made it extremely convenient regardless of being perched at the top of a long steep driveway. There is a very diverse range of boats and services to choose from in Labuan Bajo. The sailboats are absolutely gorgeous and warrant the high price points that they are associated with. The top companies that we found online were Flores XP and Le Pirate, both of which had booked up months in advance. Time for plan b, the companies a bit lower on the Trip Advisor list. We reached out to several companies and found that $300 - $600 USD was about the range we should be expecting to pay for an open (not private) 3D 2N boat trip. 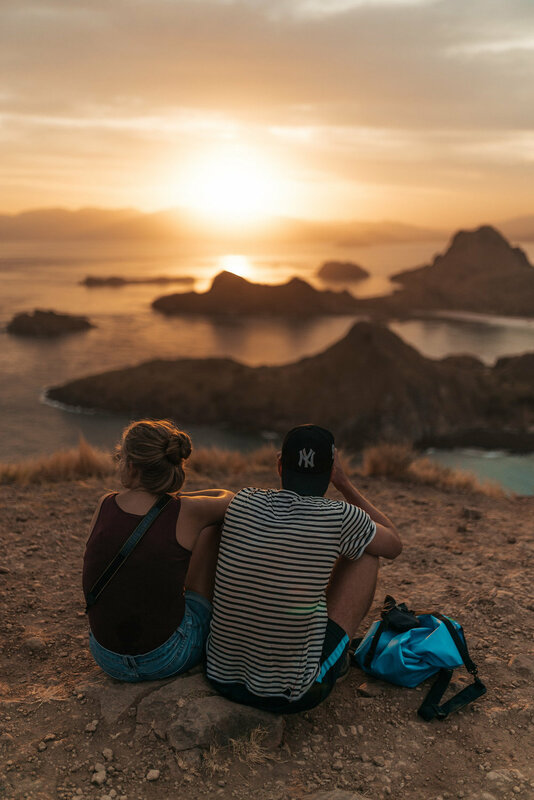 This was definitely outside of our budget and many of the tours didn’t even go to Padar Island, which is where we were looking forward to visiting. I’m sure you would get a better deal approaching one of the hawkers on the street, but we weren’t willing to do that (if you do this, make sure to ask to see the boat before booking and ask what the capacity is, how many people are booked on, and what the sleeping arrangements are). Our hostel offered an all inclusive 2D 1N trip with Floresia Tours that went to all the hot spots, including Padar Island for $80 CAD. That’s a deal we couldn’t beat AND we knew we were likely to be on a boat with other like-minded hostel folks. We boarded our boat early in the morning and set off. There were 10 guests and 3 crew onboard, which was the perfect size. There was a cabin with 4 double beds, a covered bed on the top deck and stray cushions and foam mattresses to lounge on. We were assigned a bed in the cabin, but later actually just grabbed our mattress and pulled it up to the top deck - the view of the stars was incredible and it was much cooler than below. 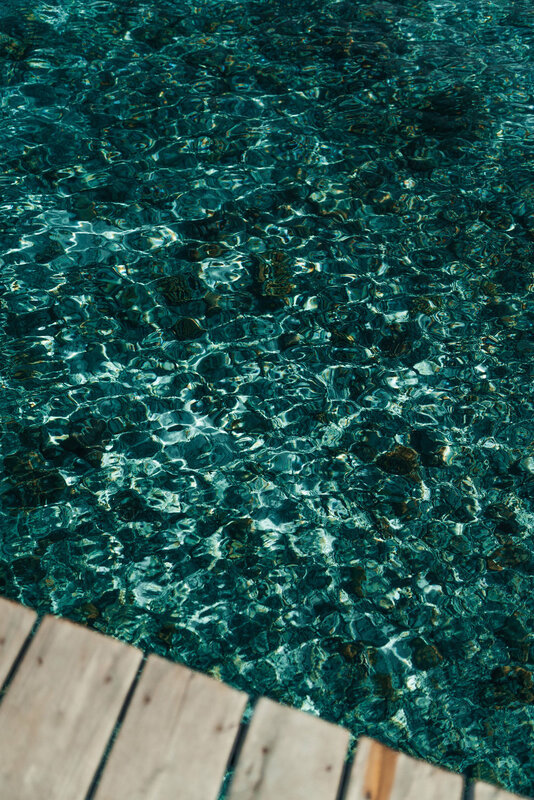 Hands down the clearest water I have ever seen. The snorkelling was incredible. It wasn’t Manta season, so expectations were low, but we ended up seeing a ton. I stopped counting at 20. A highlight of the trip, Padar Island is truly a remarkable place that I wish we could have spent more time exploring. We hiked for sunset and spent the night just offshore. We did a guided hike around Rinca to see the infamous Komodo Dragons. The reptiles are no joke, they can even take down a water buffalo. Their saliva contains a variety of highly septic bacteria so I kept a respectful distance. It was a beautiful and diverse coastline. I can only describe it as a tropical Iceland. After our two day boat trip we returned to Ciao Hostel with a full memory card and a few new friends. We did a day trip through our hostel to Rangko Cave and a couple small islands to snorkel and picnic. As the park is known to be one of the best dive areas in the world, a lot of fellow travellers were solely focused on diving as much of the park as they could. Komodo National Park is known to be quite an advanced dive area as there are strong currents and waves only suitable for people with their advance open water certification (of which I do not have). As comfortable as I am underwater, you have to have the advanced ticket to get on the big boats - which I totally respect, it is the way that it should be. The two top companies in town: Uber Scuba was full (book a coupe days in advance if you want to dive with them) and Blue Marlin only has space for advanced divers. We found a company (through Trip Advisor) called iDive who we booked with, which ended up being amazing. They are a relatively new company but our experience couldn’t have been better. Everything was great, the dive masters, the boat, the food. They even took Nic on a ‘Discover Scuba’ trip which included diving at the same reef we were and diving with Manta Rays. The three sites I dove were the Coral Garden, Batu Bolong and Manta Point. Batu Bolong was incredible, literally THOUSANDS of fish, bright healthy corals, turtles, eel, and much more. Apparently the shape of Batu Bolong has protected it from the unfortunately prevalent dynamite and cyanide fishing that goes on in Indonesia. With a day of beautiful diving, that concluded our time in Flores. 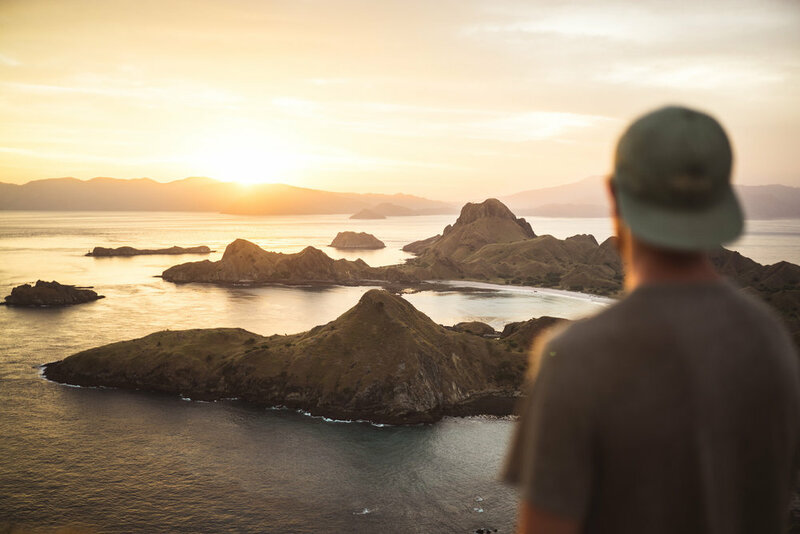 Visiting Padar and seeing the surrounding landscapes of Komodo National Park will definitely be a highlight of the entire trip.